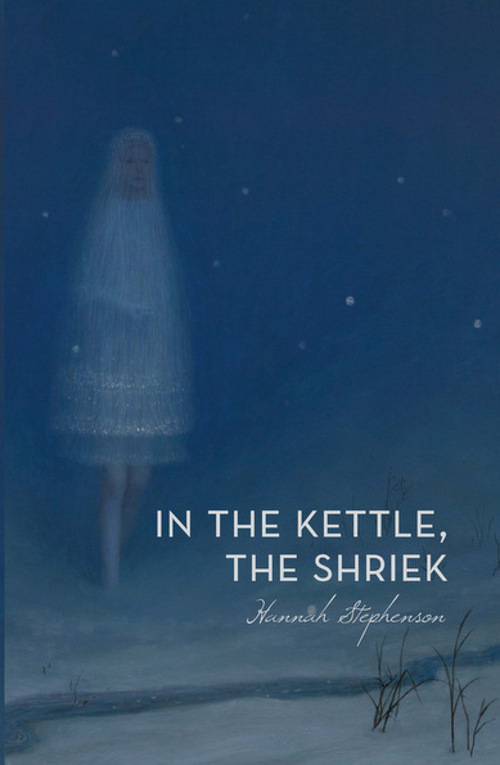 In the Kettle, the Shriek, by Hannah Stephenson. Boston, Massachusetts: Gold Wake Press. 86 pages. $15.95, paper. There is something miraculous and mysterious inhabiting Hannah Stephenson’s debut poetry volume In the Kettle, the Shriek. Through Stephenson’s meticulous style, there’s a world being constructed within its pages, a world of couplets and tercets and blocks. She uses the precision and exactitude of a watchmaker to populate this landscape with beautiful details. Then, just as minutely, this world dissolves in an epic, intense collapse. Through a beautiful narrative arc, the writer crafts a gorgeous, intelligent collection. I want you to think of a deck of cards. one. Clover-type thing, a deciduous tree. The clipped rhythms and short sentences produce a beat appropriate for a book of things being either created or deconstructed. The volume opens with “Town.” The poet writes, “It starts with a river.” She then describes the town’s emergence in a series of thirteen couplets. While we might relate this particular stanzaic formula to the presence of Adam and Eve, the sense that couplets convey a particular intimacy is indisputable. And these pieces are full of relationships: between individuals, between people and things, buildings and their contents. The poet records these connections with a sharp, attentive eye. back there, or over here. Similar instances of missing question marks occur in many other poems. One possible explanation for using this device is that the “questions” can be interpreted as statements. For example, the phrase “What did I hear today,” if read as declarative rather than interrogative, acquires different meaning. If Stephenson’s reader employs this shift in perspective, the poems acquire a prism effect akin to turning faceted gemstones in the light. Her grammatical ambiguity creates delightful wordplay and interpretative latitude for her audience, allowing them to construct this world for themselves. If the reader opts to interpret the last two tercets as declarative, then the missing punctuation leaves no question about the decision the speaker must make; the message obtains a forceful literality, and no options exist. as I elbow my way to the office in knock-off shoes. disintegrates: loose soil, sand, saltwater. Stephenson builds her microcosm one line at a time, and likewise undoes it with grace and beauty. “See how natural endings are,” she asks, revealing the lovely details of ruin. “… [A] whole house scuttles away, / dragging the block behind it / like a billowing, sparkling nebula.” And the readers sail amid the flotsam, laughing at the glorious display of lives disappearing and pulling them into the infinite, wonderful darkness. In the Kettle, the Shriek at Amazon.com. In the Kettle, the Shriek at Powell’s City of Books. In the Kettle, the Shriek at Gold Wake Press. Paul David Adkins lives in New York and works as a counselor there. He served in the US Army for twenty-one years.